Complete the entry form below for your chance to win one of these festive Christmas decorations. Arctic Fashion's popular Win a tonttu competition is back again for Christmas 2010. Enter now for your chance to win a special tonttu Christmas decoration - for you and a friend! This bright red tonttu table decoration makes a fun and festive addition to your home at Christmas. With a red felt hat and smiley face, Tonttu has authentic Scandinavian charm and perfectly captures the magic of Christmas. 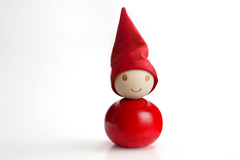 From Santa's home Finland, tonttus are charming, versatile and eco-friendly Christmas decorations. Beautifully crafted from sustainable wood by Finnish designers Aarikka, they make durable decorations you, your family and friends can enjoy year after year. Whether you use tonttus to add Yuletide charm to your home by placing them on tabletops, mantelpieces and shelves, to create bright, personal table place card holders or give them as special gifts, is up to you. Click here to view our full collection on tonttus. Answer the question and send us your entry details before 15th December 2010. There will be a draw each week to select the best entry from all the entries received so far - so the sooner you enter, the more chances you have to win! Recommend the competition to friends, family and work colleagues to multiply your chances of winning. If they enter, name you as their friend on their entry form and win, you will win too! No purchase necessary, but you do need to be resident in the United Kingdom. Winners will be contacted by email/telephone and announced on this website. When they enter, make sure they add your name in the Your friend's name box. Also ask them to enter your email address in the Your friend's email box - this will help us identify you in the event that several entrants have the same name. Then if they win, you win too! Did a friend recommend this competition? Click here for more info. That way if you win, they win too! If you found out about this competition from a friend, please enter their name and email here. As long as your friend has entered this competition as well, if you win, they will win too! Please tick this box to be amongst the first to learn about new competitions, special offers and products. What is a Santa's elf known as in Finnish? Arctic Fashion takes your privacy seriously. We will not disclose your information to any other companies. Any information you provide when registering for the Arctic Fashion newsletter will be stored and used exclusively by Arctic Fashion in line with the Data Protection Act. No purchase necessary. Please enter your name, email address and contact number in the spaces provided. Only one entry per person allowed. There will be a maximum of two winners (the winner and a named friend) each week who will win a Tonttu. Entrants may name one friend on their entry form. If they win, their named friend will also receive a tonttu provided they too have entered the competition. If a friend does not enter the competition before the winning draw, they will not be eligible to win a tonttu and only the winner will receive a prize. A draw will take place once a week to select the best tonttu description from all entries received so far which means each entry has multiple chances to win. The prize winners will be notified by telephone/email. If a selected entrant does not meet all of the contract conditions, another entrant will be selected from the remaining eligible entries. To be eligible to win, entries must be received on or before the closing date of 15th December 2010 at 11:59 PM. Winners are also announced on this website and on the Arctic Fashion Facebook page. If the winner cannot be reached by December 18th 2010, the prize will be donated to charity. All entries shall become the property of Arctic Fashion (UK) Limited, and their directors and promotional agencies are not responsible for contacting or forwarding prizes to entrants who provide unclear or incomplete information. No cash alternative will be offered. The prize is non-transferable. This competition is not open to employees of Arctic Fashion (UK) or Smart Media Limited or their immediate families. By entering the contest, entrants consent to the use of their names, city of residence, photograph and/or image for publicity purposes in all media carried out by Arctic Fashion, without payment or compensation. Entries must be submitted by the named entrant (or their parent/Guardian for children aged 15 or under) and will be invalid if found to come from a third party. Multiple entries from a single source (eg 'competition entry' website/company) will be disqualified. Only one entry will be accepted per email address used. Entry to the competition is conditional on acceptance of these terms and conditions. By clicking on the Submit button above you are deemed to have read and accepted these terms. Arctic Fashion has organised this prize draw in good faith and does not accept liability relating to the prize. All entries received before midnight on Wednesday 17th November will be counted in this draw. All entries received before midnight on Wednesday 24th November will be counted in this draw. All entries received before midnight on Wednesday 1st December will be counted in this draw. All entries received before midnight on Wednesday 8th December will be counted in this draw. Entry closes at 11:59PM, Wednesday 15th December. All competition entries will be counted in this draw.